Ever since Kent Stowell’s stunning new production of Swan Lake marked the grand opening of McCaw Hall, audiences have been awestruck by its transcendent beauty and power. This most famous of classical ballets is a tour de force on all levels: Tchaikovsky’s glorious score, spectacular costume and scenic designs, plus a ballerina’s hallmark achievement—the dual role of Odette/Odile. Swan Lake’s mist-filled rows of exquisite swans hovering protectively around their queen is an ethereal vision that lingers long after leaving the theater. Kent Stowell’s Swan Lake was made possible by the E.L. Wiegand Foundation. Swan Lake is considered by many to be the greatest classical ballet of all time. With its fantastical plot filled with romance, sorcery, and betrayal, Swan Lake offers ballerinas the ultimate challenge of a dual role―Odette, trapped in the body of a white swan while awaiting an oath of true love to set her free, and Odile, the temptress daughter of Baron Von Rothbart, who plots the downfall of Odette’s true love, Siegfried. Pacific Northwest Ballet’s 1981 production was a significant milestone as the first full-length ballet re-created for the Company. The current production of Kent Stowell’s Swan Lake, in a revised staging and featuring new designs, premiered in 2003 to open PNB’s inaugural season in Marion Oliver McCaw Hall. The image of a swan has come to represent the lyrical image of a dancer, and for that we have to thank three men: composer Peter Ilyich Tchaikovsky and choreographers Marius Petipa and Lev Ivanov. Tchaikovsky composed his score for Moscow’s Bolshoi Ballet in 1877, but it was not until Petipa and Ivanov’s St. Petersburg production of 1895 that Swan Lake took the form we know today. The ballet has since inspired countless choreographers, who, in their own productions, seek to extend the ideas and meanings suggested in the work of its creators. Tchaikovsky longed for a successful revival of his first ballet. The original Moscow production, now generally regarded as a failure, actually achieved mild success and saw more performances over more years than most ballets premiered on the Moscow stage. The choreography, by the otherwise unknown German ballet master Julius Reisinger, was admittedly undistinguished. Anti-German sentiment fueled opinions against both the dance and the story, which was thought to have originated in Germanic legend. Tchaikovsky’s score was admired but considered unsuitable for ballet—not sufficiently dansante. Tchaikovsky died in 1893. A memorial concert in St. Petersburg the next year included a revival of Swan Lake Act II, the first lakeside scene, with new choreography by Lev Ivanov, ballet master Marius Petipa’s assistant. The performance was a success and plans were laid for a revival of the entire ballet in 1895. Ivanov choreographed Act IV, the second lakeside scene, and Petipa supplied dances for Acts I and III. Tchaikovsky’s brother, Modeste, labored to streamline the story, while conductor Riccardo Drigo took on the unenviable task of editing the sometimes unwieldy musical score. What Tchaikovsky had composed was far ahead of its time, but the 1895 team forged on. Some compromises were inevitable. The score is mammoth and the relative length of the four acts unbalanced. With Petipa in the lead, some music was transferred between acts, some numbers cut, others added. These efforts paid off. While not an unqualified hit, Swan Lake was a solid success. Petipa had a genuine star in ballerina Pierina Legnani, who danced the role of Odette/Odile at the revival’s premiere. For years, the ballet master had imported Italian ballerinas as guest artists, infusing their strong pointe work with the lyricism of the French style that served as the basis for ballet training in Russia. Likewise, the Italians influenced their foreign colleagues, inspiring them to new feats of virtuosity. Although Petipa succeeded with his choreographic contribution, Ivanov’s “white” acts provided the images by which Swan Lake has become iconic. Movements and poses suggest swan wings, necks, and bodies and offer images of flying, swimming, and preening in a purely stylized way that has enabled the choreography to transcend the particular aesthetics of its time and become immemorially expressive. The 1895 revival of Swan Lake has served as the basis for nearly every production since then. The dual role of Odette/Odile, still stamped with Legnani’s artistry and brilliance, remains a coveted challenge for ballerinas and is broad enough in concept to sustain an endless variety of interpretations. Tchaikovsky’s score, his first attempt to compose for ballet, came into its own during the 20th century, as dance and dance production developed to embrace it as Swan Lake’s motivating force. But, as George Balanchine once commented, “Swan Lake is always changing. That is as it should be.” Nineteenth-century tradition allowed choreographers carte blanche when approaching existing work. Total or partial revision of staging and choreography was standard, as was re-writing of the scenario, and liberties were taken with the musical score. Following tradition, choreographers in our own century often have re-visited Swan Lake, for the ballet lends itself generously to new stagings and new interpretations. Pacific Northwest Ballet’s Swan Lake dates from 1981, when Mr. Stowell and Ms. Russell mounted here the production they had first created for the Frankfurt Ballet in 1976. Preserving the best of the St. Petersburg original as it has come down to us through England’s Royal Ballet, Ms. Russell researched and staged what has long been regarded as the soul of Swan Lake―nearly all of Ivanov’s Act II, where music and dance are sublimely fused. Petipa’s Act I pas de trois and Act III Black Swan pas de deux were also retained. To enhance the story line, and following in the path of many choreographers, Mr. Stowell made important changes in the order of the musical numbers. 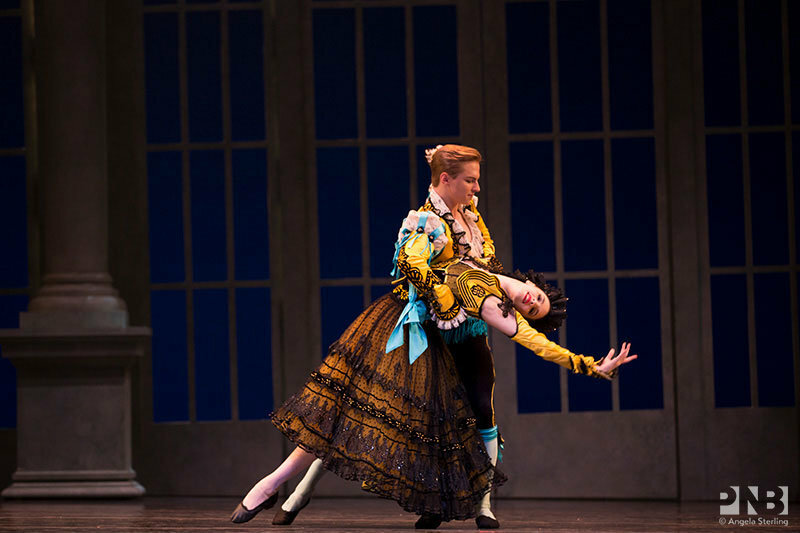 He also re-choreographed most of Act I, the national dances in Act III, and all of Act IV, rescuing the usually forgotten last act with a radiant pas de deux and giving the conclusion dramatic power and unity. Audience Education Manager Doug Fullington changes up the regular lecture format, and dedicates the 30-minutes of Ballet Talk to a Q&A for the attending audience. He answers questions like, “do the dancers look forward to this ballet?” and “are there different endings to Swan Lake?”. Of course, as always, Doug is an encyclopedia of dance and music history and he has the audience laughing with his replies. Tune into a live studio rehearsal of Kent Stowell’s Swan Lake. The entire company will be rehearsing Act II, which includes the precise choreography of 24 corps de ballet, a pas de deux between Odette and Prince Siegfried, and the famous four little swans. This event won’t be recorded – so be sure to sign up for a reminder! Observe PNB principal dancers both preparing the role of Odette/Odile and coaching advanced students of Pacific Northwest Ballet School in some of Swan Lake’s iconic solos. Learn the origins of Swan Lake and how its rich history has made it one of the most beloved ballets of all time. PNB Conversations offers in-depth interviews with choreographers, stagers, designers, dancers, and other artists during the hour preceding dress rehearsal reveal the creative process involved in the development of a ballet. Join PNB Education Programs Manager Doug Fullington or guest speakers for an engaging 30-minute introduction to each performance, including discussions of choreography, music, history, design, and the process of bringing ballet to the stage. Call our Box Office at 206.441.2424 to create a new package over the phone!